Arizona is synonymous with immigration drama. There was SB 1070 in 2010 and the infamous antics of the convicted former Sheriff Joe Arpaio. So when President Trump arrived at the Phoenix convention center for his rally, it was a safe bet he’d serve up some immigration red meat. There was immigration red meat, but unlike other rallies Trump has held in Arizona it wasn’t the main course. Let’s say immigration was a healthy-sized side portion. Of his 77 minute speech the majority of his time was spent bashing the media and the two home state Republican Senators, Senator John McCain and Senator Jeff Flake. The President feels personally offended at what he believes is an unfair characterization of his Charlottesville response. Then there’s President Trump’s personal beef with the Arizona GOP Senators. Recently Senator Jeff Flake released a book were he essentially bashes the president. Then there’s Senator McCain’s vote against repealing Obamacare. The Arizona Senators don’t like Trump and Trump doesn’t like them, a point that was resoundingly clear last night. 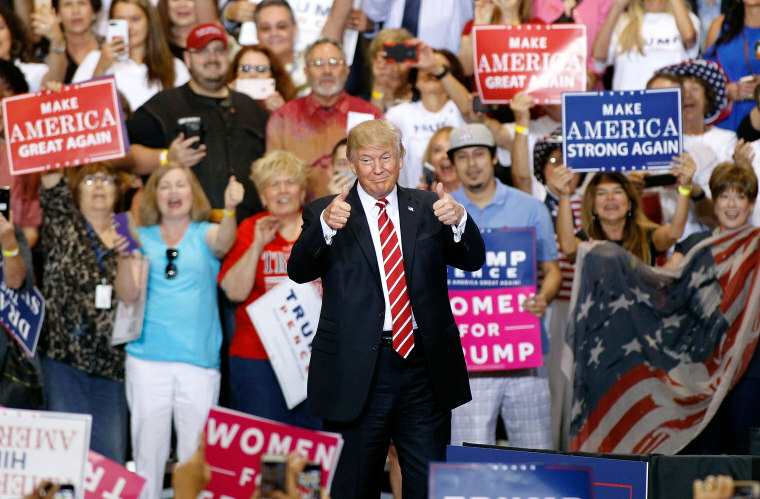 Beyond settling his personal scores with the media and the Arizona senators Trump did not disappoint in his immigration message. Close to a year ago Donald Trump stood in that same Phoenix convention center laying out his plan to build the border wall and restrict immigration. Once President Trump accepted he would not get Mexico to pay for the wall he turned to Congress. Congress, like Mexico, doesn’t have any interest in paying $4 billion for a border wall. Congress also doesn’t have any interest in shutting down the government, as Senate leader Mitch McConnell has repeatedly said. Again, wall talk was a about red meat; it was about revving up the base, even though there's nothing legislatively substantive or even possible. Then there’s Sheriff Joe. President Trump did not issue a presidential pardon for Arpaio, who's being held in contempt of court for racially profiling Latinos. He might as well have considering his remarks. President Trump dismissed the issue of racial profiling and instead said that Sheriff Arpaio was only doing his job. The border wall, allowing for racial profiling and a general clamping down on immigration talk were all there last night. It might not have been a classic immigration red meat dinner, but it was sure to satiate the crowd’s hunger.